Accession records provide administrative and descriptive information that identifies the contents, provenance and disposition of the materials transferred to the archival institution. The accession record is designed to establish basic intellectual and physical control over a new accession at the time it is received by the archival institution. In AtoM the accession record includes data entry fields to capture donor information (e.g., donor name and contact information) and rights information (e.g., type of act, rights holder, dates and basis of rights). Once created, Donor records and Rights can be managed separately. For information on creating and managing accession records, see: Accessions. Archival descriptions provide contextual information about archival materials and are arranged into hierarchical levels (fonds, series, files, items, etc.). The default archival description edit template contains data elements based on the ICA’s General International Standard Archival Description (ISAD). Other edit templates are also available: Dublin Core,The US Library of Congress’ Metadata Object Descriptive Schema (MODS), the U.S. Describing Archives: A Content Standard (DACS), and Canadian Rules for Archival Description (RAD). For information on creating and managing archival descriptions, see: Archival Descriptions. Authority records provide descriptions of the actors (corporate bodies, persons, and families) that interact with archival materials as creators, custodians, subject access points, etc. The edit template is based on the ICA’s International Standard Archival Authority Records (Corporate bodies, Persons, Families) (ISAAR). Authority records are linked to archival descriptions in AtoM by events delimited by start/end dates. Through events, one actor can have zero, one, or many relationships to zero, one, or many archival units; and one archival unit can have zero, one, or many relationships to zero, one, or many actors. Event relationships link ISAAR authority files (descriptions of actors) and ISAD records (descriptions of archival materials). For information on creating and managing authority records, see: Authority records. Archival institution records provide descriptions of repositories that preserve and provide access to archival materials. The edit template is based on the ICA’s International Standard for Describing Institutions with Archival Holdings (ISDIAH). Archival institutions are actors that hold archival materials. As such, many archival descriptions can be linked to an archival institution as holdings. For information on creating and managing archival institutions, see: Archival Institutions. Functions provide a means of describing the activities of records creators and other actors linked to records creation and maintenance. Analysis of the functions of corporate bodies is important as the basis for many recordkeeping activities. Functions are recognised as generally being more stable than administrative structures, which are often amalgamated or devolved when restructuring takes place. Functions are therefore well suited to act as a basis for the appraisal, arrangement, classification and description of records, and as a tool for the retrieval and analysis of records. In AtoM the functions edit template is based on the ICA’s International Standard for Describing Functions (ISDF). Functions are linked to authority records and to other functions. For information on creating and managing functions, see: Functions. Rights records provide rights related restrictions that can be linked to accession records, archival descriptions and digital objects. AtoM Rights metadata elements use PREMIS rights elements. In AtoM restrictions can be based on Copyright(s), License, Statute(s) and Policy. Rights are inherited in AtoM, which means that rights added at a higher level (e.g., fonds level) are inherited by the lower levels (e.g., item level). If you add rights to an accession, all archival descriptions created from that accession will inherit the same rights. If you add rights to an archival description at the fonds or collections level, all lower levels (aka child records) such as the file or item-level will inherit those rights. For information on creating and managing rights records, see: Rights. Terms provide controlled vocabularies used throughout the system (e.g. as access points or in drop-down value lists). They are organized into separate taxonomies. Within the edit templates, many of the terms that appear in the value lists are derived directly from the controlled vocabularies used in the standards upon which the edit pages are based. AtoM ships with a fixed number of taxonomies containing default values (terms). Some terms are locked, i.e. cannot be edited or deleted, because they are used by the application’s underlying code. Most terms, however, can be edited or deleted, and all taxonomies can be assigned new terms in addition to any locked values. 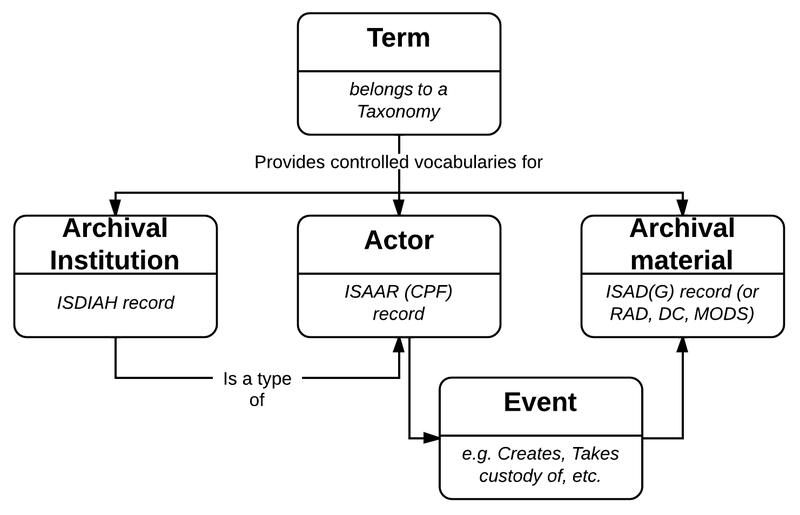 Two of the most common taxonomies seen and used by public users are subject and place terms, which can be added as access points to archival descriptions. For information on creating and managing terms, see: Terms.